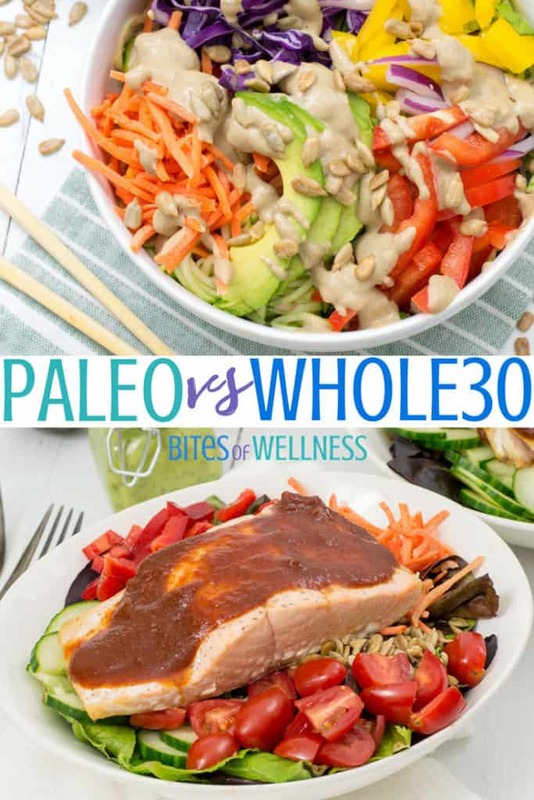 Home / Wellness Informational / Paleo vs Whole30: Which one is right for you? Paleo vs Whole30: Which one is right for you? So what is the difference between Paleo vs Whole30? Is there an advantage to doing one over the other? Is one better than the other for beginners? Is there one that will help you lose more weight, faster? 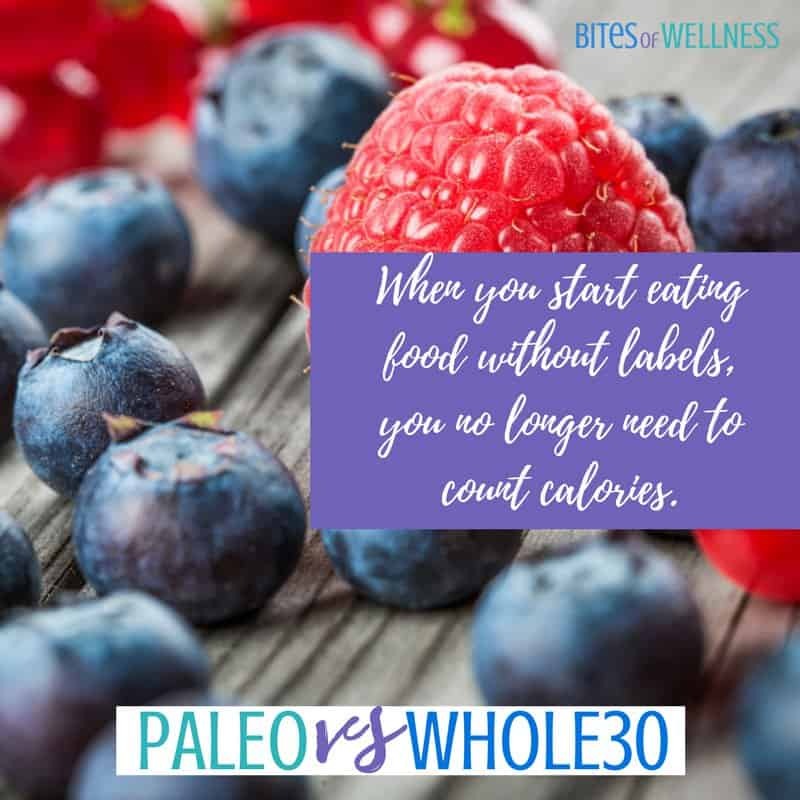 Whether you are new to fitness and healthy living or you have been around for awhile, you probably have heard the terms “paleo” and “whole30” being brought up pretty regularly (along with vegan, clean eating, IFFYM, carb cycling, calorie counting, etc). You have probably heard stories of people “going paleo” or “doing whole30” and losing weight in a month or two time. You may also hear claims like it cleared up my acne, reduced my bloating or gas, reduced or eliminated my eczema or other skin condition. Paleo and whole30 have a lot of similarities, but overall are completely different. Let’s talk about some of the similarities first! Focus on whole food nutrition – getting a majority of your nutrients from whole foods. Whole foods in this sense refers to food that has not been processed (or very limited in it’s processing). These foods look very similar to how they looked when grown or killed. For the most part this refers to a diet rich in: meat, seafood and eggs, vegetables and fruits, nuts and seeds and fats and oils. However Paleo and Whole30 do have some very distinct difference. Paleo eating is a long term lifestyle, while Whole30 is meant to be a reset for your system. The creators of Whole30 do not intend for people to eat this way year round. The Whole30 protocol is very restrictive, and it provides a guide on how to slowly add back in foods you removed while doing Whole30. Sugar in all forms, including honey, maple syrup, coconut sugar. Whole30 also does not allow for “treat foods” to be incorporated. For example, you cannot make banana pancakes from mashed bananas and eggs even though both of these ingredients are technically Whole30 approved. Also commercially made chips and tortillas are also not Whole30 approved. Whole30 also has a strict “no scale” rule. Simply jumping on the scale during a Whole30 technically restarts your Whole30 journey. Paleo doesn’t have strict rules, if you eat something “not paleo”, you just keep on going with your day. However, if you eat something not compliant with Whole30, you technically ended your Whole30 at that point. Whole30 has a very clear “reintroduction” plan at the end of the 30 days. This plan gives detailed instructions on how to add in foods you removed to be able to easily see if these foods cause you any inflammation or digestive issues. Paleo however does not have an end, since it is not a traditional diet. It also does not suggest you add things like gluten or grains back in at any time. When trying to decide if Paleo or Whole30 is right for you, it’s important to know yourself, as well as, what your goals are long term. Whole30 provides a very clear set of rules and a distinct timeline and can also help you eliminate that pesky sugar monster. However, it is much more strict than paleo and you can at times feel very limited in your food choices (especially if you are very busy and don’t cook often). Whole30 requires you to know the ingredients in everything you eat and does not provide for much spontaneity since most packaged foods are not Whole30 approved. If you’re looking to learn more about Whole30 I highly recommend The Whole30 by Melissa Hartwig (affiliate link). Paleo is not meant to be a fad diet but a way of life. That is why paleo tends to be a little more flexible than Whole30. When following a paleo lifestyle, it is very easy to continue to fill up on “paleo approved” treats and continue to not feel your best. Want to learn more about the paleo lifestyle and get more amazing recipes? I highly recommend Practical Paleo by Diane Sanfilippo (affiliate link). 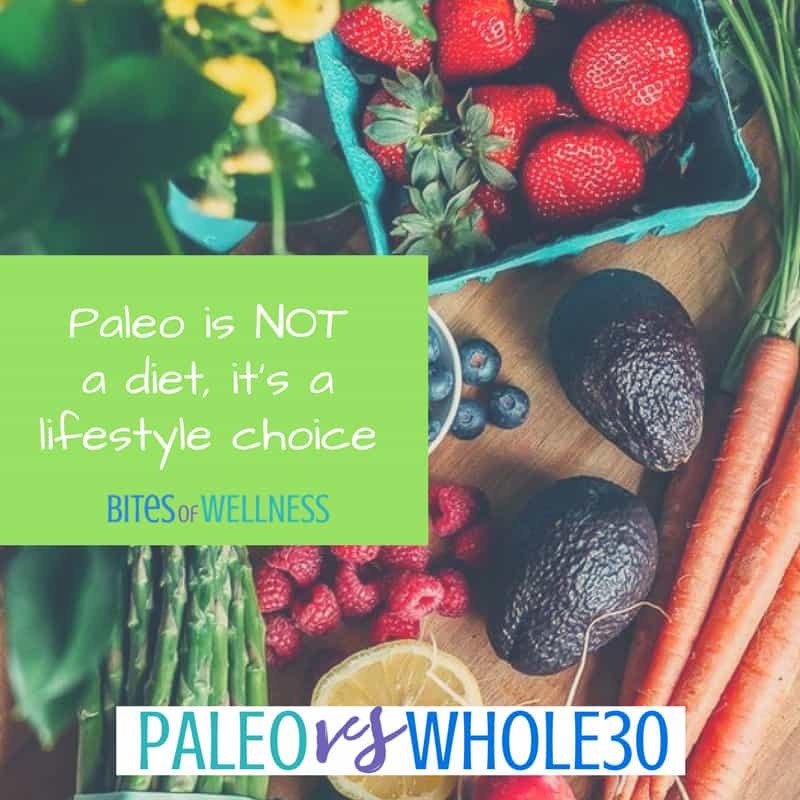 Both paleo and Whole30 will help you remove potential inflammatory causing foods (gluten, grains, dairy) as well as help you focus on eating whole foods. Paleo and Whole30 will also help you learn if a certain food causes your body any distress. Looking for Easy Paleo or Whole30 Recipes? Want to learn more about paleo vs whole30? Check out the video below. Tell me your favorite paleo or Whole30 food! I’m a fan of paleo for near 1 years. It attract me than others. I have done 90 days of W30 and felt fabulous, I am about to start another round. I have also done Paleo and liked it as well but the treats that you can make on Paleo are what do me in. I have no restraint so I feel W30 is better for me. I’m currently on day 13 of Whole30. I feel great and notice many of my ailments have disappeared. I’m considering easing myself into Paleo after my Whole30, Whole60 or Whole90, depending how n how long I can sustain this Whole## reset. I have all the books. I actually purchased the Practical Paleo book last year but never convinced myself to begin. I think the Whole30 is a great introduction to the Paleo lifestyle after I identify what causes my biggest health concerns. I have tried Whole30 back in February 2017 and I loved the results – both losing weight and feeling good. I took a break and did it again sometime in March-May, although not continuously. This month, I am strictly following the Whole30 rules as long as possible. I don’t know, maybe it became a lifestyle. Paleo sounds cool, too. Atleast I can eat ‘healthy’ desserts.? Thanks for sharing and for joining Fiesta Friday party!